This has to be one of the most beautiful dresses I’ve ever seen. 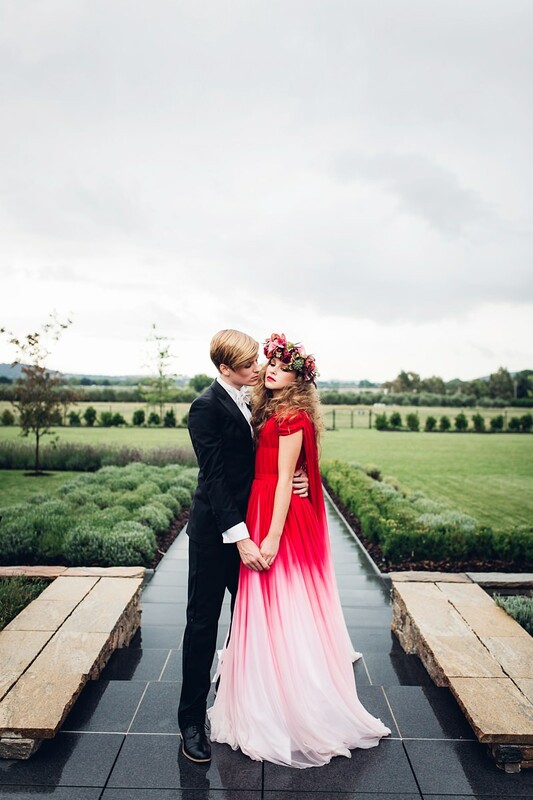 Designed by Vicky from Rockstars & Royalty, the metres of silk were hand dyed creating a stunning red & white ombre effect. Another sneak peek from a beautiful styled shoot at Pialligo Estate Winery in Canberra, shot on a recent visit back to Australia in January. It was so great to work with Vicky from Rockstars & Royalty and Fionna from Peony’n’Pearl (look at that amazing flower crown!). I posted another sneak peek from a beautiful Peach Orchard wedding shoot a couple of weeks ago & this time last year we created this stunning Fairytale Tea Party in a redwood forest in Canberra. More from this elegant styled wedding inspiration shoot soon– follow me on Facebook to see more. Genevieve from Miss Gen Photography is a London & Canberra based photographer specialising in creative reportage wedding photography – documentary style photography that tells the story of your day and creative, natural couples portraits. Genevieve is available to shoot weddings, elopements, couples sessions and family sessions in London, throughout the UK, Europe, Australia and worldwide for destination sessions. To book me get in touch, I’d love to hear all about your plans. This is such a stylish photograph. Beautiful picture, I love the romantic look.